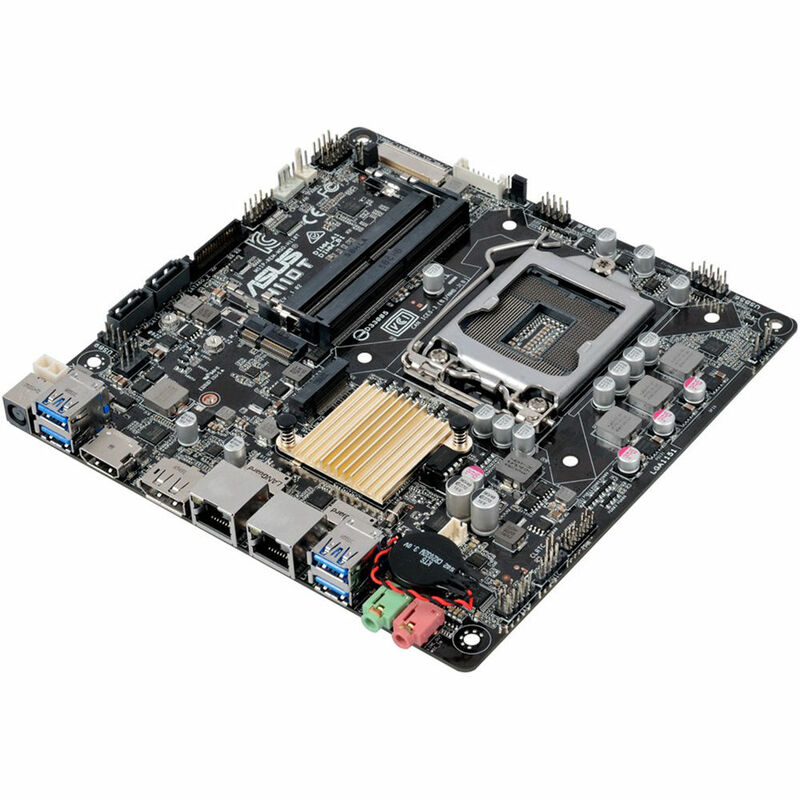 The ASUS H110T/CSM LGA 1151 Mini-ITX Motherboard comes with features so you can build an all-in-one system or an ultra-slim client workstation. This motherboard sports an LGA 1151 socket and H110 chipset to support Intel's 6th generation of processors. To help fit in a slim chassis, it has two SODIMM slots that are angled to hold your DDR4 2133 MHz memory modules parallel to the board, similar to a notebook configuration. Additionally, this motherboard is outfitted with an LVDS slot that interfaces with an internal LVDS-equipped display for AIO builds. ASUS has armed the H110T/CSM with an M.2 M-key slot along with two SATA ports to connect with SSDs, hard drives, and PCIe-based storage drives. For graphics, it utilizes an integrated Intel graphics engine to deliver up to 4K visuals through the DisplayPort, HDMI, and LVDS ports. To complete the multimedia experience, a Realtek ALC887 controller outputs 7.1-channel sounds using the motherboard's audio jacks. The H110T/CSM motherboard connects to the Internet and networks via two Gigabit Ethernet ports. It lets you create a wireless system by installing an optional Wi-Fi/Bluetooth module to the onboard M.2 E-key socket. Other notable connections include four USB 3.0 ports for your printers, external storage drives, and other digital devices. The Intel H110 is a single-chipset design that supports 6th-generation Intel LGA 1151 Core i7, i5, i3, Pentium, and Celeron processors. It provides improved performance by utilizing serial point-to-point links, allowing increased bandwidth and stability. Additionally, the H110 natively supports up to four USB 3.0 ports. It also supports integrated-graphics (iGPU) functions, so you'll enjoy Intel integrated graphics performance. This motherboard supports 6th-generation Intel Core i7, i5, i3, Pentium, and Celeron processors in the LGA 1151 package, with graphics, memory and PCI Express controllers integrated to support onboard graphics output with dedicated chipsets, two-channel (2-DIMM) DDR4 memory and 16 PCI Express 3.0/2.0 lanes for improved graphics performance. LANGuard is hardware-level networking protection that employs signal-coupling technology. Premium anti-EMI surface-mounted capacitors ensure a reliable connection and throughput. Electrostatically guarded and surge-protected components provide tolerance to static electricity and improved protection against surges. A circuit design with built-in voltage regulators protects your chipset, connectivity ports, and audio codecs from damage caused by high-level voltages from unstable or inferior power supplies. Onboard re-settable fuses prevent overcurrent and short-circuit damage. This extends beyond I/O ports to DRAM to safeguard the lifespan of both your system and connected devices. DIGI+ VRM delivers power to the processor based on real-time demands, reducing energy waste and improving system stability. Corrosion-resistant stainless steel back I/O panels bonded with chromium oxide. This motherboard supports dual-channel DDR4 with up to 32 GB of system memory and non-ECC, un-buffered memory at 2133 MHz. The updated UEFI BIOS features the EZ Flash 3 mode to update the latest BIOS via the internet and from within the graphical, mouse-controlled BIOS. The S.M.A.R.T mode lets you check up your storage devices' Self-Monitoring, Analysis, and Reporting Technology (S.M.A.R.T) logs to gauge reliability, and to determine if they're about to fail. Q-Fan control allows you to configure the fan's operating speed manually, or use the easy pre-configured fan profiles to select Standard, Silent, Turbo, or Full Speed modes. The My Favorites mode lets you quickly find tuning options and add preferred tools to the list. Fan Xpert ensures that every fan achieves the balance of cooling performance and low noise. It includes an Auto-Tuning mode to scan and detect fan characteristics for single-click customization. AI Suite 3 offers a clear and attractive interface with support for large monitors. It consolidates ASUS features into one simple-to-use package, allowing you to supervise overclocking, energy consumption, fan speeds, voltages and more. This all-in-one app offers diverse and easy to use functionality, with no need to switch back and forth between different utilities. This thin Mini-ITX motherboard is less than 1" tall and has a built-in connector for external DC power. It is suitable for all-in-one (AIO) PCs and other slimline builds. Box Dimensions (LxWxH) 9.0 x 7.3 x 2.5"
H110T/CSM LGA 1151 Mini-ITX Motherboard (Standard Packaging) is rated 5.0 out of 5 by 1. Rated 5 out of 5 by Anonymous from Makes a great little server I put this board into a low-profile case to work as a micro-server running Linux. For this task, the board is excellent.